What is DivX? and how do I install and use it to play DivX movies ...? Note: The DivX-codec is available for multiple platforms like Linux, Windows, Macintosh and PocketPC. Tip: The original codec (3.11 alpha) can still be downloaded here. DivX is originally the name of a copy protection for DVD's. Thank God that didn't turned out to be a succes :) The name however is now used to identify the "hacked" (by Gej) version of Microsofts MPEG4 encoder for video compression, called DivX ;-). Others, like Smr, hacked the codec too, but it never turned out to be such a succes as DivX. Using MPEG4 a better compression is achieved in comparison to MPEG2 (used in DVD's). Not only video is differently compressed, DivX uses MP3 (or WMA) for audio compression as well. Note: In the mean while some DivX capable DVD players appeared from companies like LiteOn, Kiss, Revoy and even Philips. In the meanwhile two initiatives started building the DivX codec from scratch without a line of Microsoft code in it. See www.DivX.com and the Project Mayo (OpenDivX). DivX.com is offering a free download, including easy install, of the newly made DivX codec. The DivX codec allows you to copy an entire DVD to be compressed to one single CD (or 2 if you want the extras or your movie is very very long). Many of these movies can be downloaded from newsgroups like alt.binaries.movies and alt.binaries.movies.divx. For playback and creating a DivX movie you will need the DivX codec. Your first decision will be if you are going to be using the original DivX ;-) codec or the DivX.com codec. Since the DivX.com codec is not a hacked codec and therefor legal - I can only suggest to use that one. Download it at www.DivX.com. Both codecs are compatible with Windows 9x, ME, 2000 and XP. The DivX codec by DivX.com can be downloaded for other operating systems too. Windows will warn you that the setup of the original DivX ;-) codec will overwrite the existing MPEG4 codecs. That's OK. Warning Not a Digital Signed Driver. 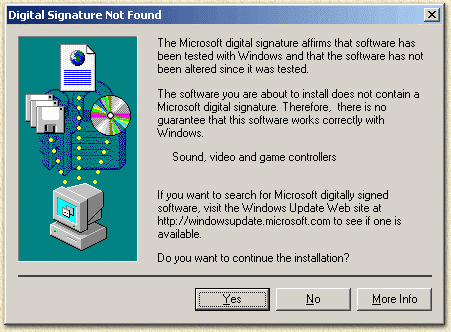 Windows 2000/XP will warn you that the codec is not certified by Microsoft... do we care? DivX.com: The setup will run flawless. One question might popup asking you if this codec should playback DivX movies created with the old codec - in order to be able to playback older movies: please confirm. For playback of DivX movies, you can use the Windows Media Player (7.0 or better). This works for both codecs. Optional, with the DivX.com codec, you can use the "Playa" DivX player that comes with the codec. Advantage here is that it supports DivX movies that are protected with some kind of copyright thing (when getting commercial DivX movies). Best of all: use MicroDVD. It does support a lot of cool features, one of them is the support of optional, one or more languages, subtitles! Tip: for most DivX player you can use ALT+ENTER to toggle between compact mode and fullscreen mode. You can also use the SPACEBAR for Start/Pauze.